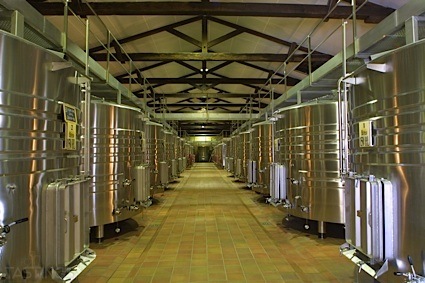 Bottom Line: A vanilla-forward wine for the gang. 86 • Black Box 2015 Cabernet Sauvignon, Central Valley 13.2% (Chile) $20.09. 87 • Black Box 2015 Merlot, California 13.5% (USA) $20.09. 85 • Black Box 2015 Malbec, Mendoza 13.5% (Argentina) $20.09. 88 • Black Box 2014 Shiraz, California 13.5% (USA) $20.09. 87 • Black Box 2015 Sauvignon Blanc, Central Valley 12.5% (Chile) $20.09. 82 • Black Box 2015 Riesling, California 12% (USA) $24.49. 86 • Black Box 2015 Chardonnay, California 13.5% (USA) $20.09. 86 • Black Box 2015 Pinot Noir, California 13% (USA) $24.49. 88 • Black Box 2015 Pinot Grigio, California 12.5% (USA) $20.09. 84 • Black Box 2016 Cabernet Sauvignon, Chile 13% (Chile) $25.00. 88 • Black Box 2016 Sauvignon Blanc, Chile 12.5% (Chile) $25.00. 86 • Black Box 2015 Malbec, Mendoza 13.5% (Argentina) $25.00. 82 • Black Box 2015 Merlot, California 13.5% (USA) $25.00. 84 • Black Box 2016 Cabernet Sauvignon, Chile 13.5% (Chile) $25.00. 86 • Black Box 2016 Red Blend, California 13.2% (USA) $25.00. 90 • Black Box 2016 Pinot Grigio, California 12.5% (USA) $25.00. 83 • Black Box 2015 Merlot, California 13.6% (USA) $25.00. 88 • Black Box 2016 Rosé, California 12.7% (USA) $25.00. 82 • Black Box 2016 Sauvignon Blanc, Chile .5% (Chile) $25.00. 83 • Black Box 2015 Malbec, Mendoza 13.3% (Argentina) $25.00. 84 • Black Box 2016 Riesling, California 12% (USA) $25.00. 89 • Black Box 2015 Pinot Noir, California 12.8% (USA) $25.00. 84 • Black Box 2016 Chardonnay, California 13.5% (USA) $25.00. 83 • Black Box 2017 Cabernet Sauvignon, Chile 13% (Chile) $6.25. 85 • Black Box 2017 Pinot Grigio, California 12.5% (USA) $6.25. 83 • Black Box 2017 Pinot Noir, California 13% (USA) $6.25. 86 • Black Box 2016 Rosé, California 12.5% (USA) $6.25. 86 • Black Box NV Red Sangria 10% (USA) $6.25. 84 • Black Box 2016 Red Blend, California 13% (USA) $6.25. 84 • Black Box 2017 Sauvignon Blanc, Chile 13% (Chile) $6.25. 80 • Black Box 2017 Pinot Noir, California 13% (USA) $6.25. 87 • Black Box 2017 Pinot Grigio, California 12.5% (USA) $6.25. 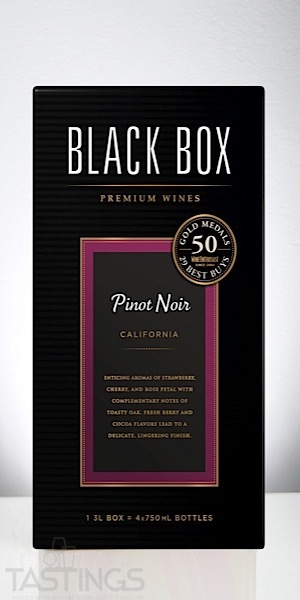 Black Box 2017 Pinot Noir, California rating was calculated by tastings.com to be 80 points out of 100 on 12/11/2018. Please note that MSRP may have changed since the date of our review.